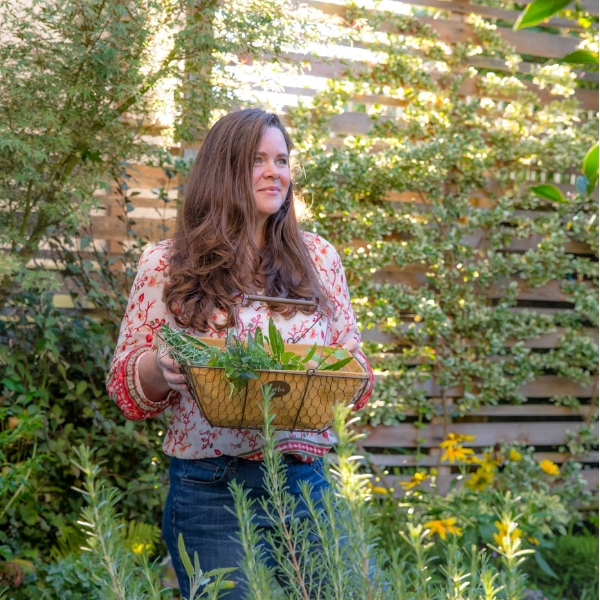 Local author, speaker, and organic gardening expert Carolyn Herriot joins us today with this wonderful fall project from her book The Zero-Mile Diet: A Year-Round Guide to Growing Organic Food (Harbour Publishing). 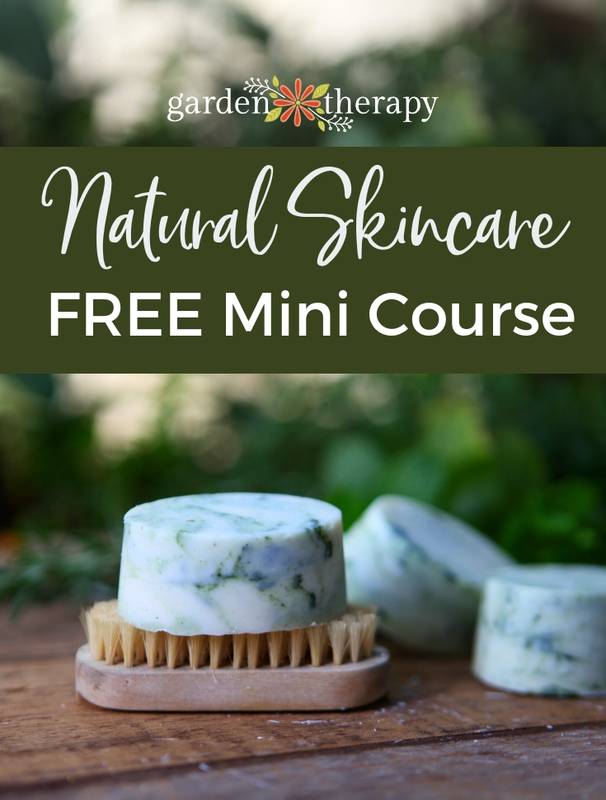 If you have followed along with my posts on planting garlic as well as harvesting and cooking with the garlic scapes, then the next steps are harvesting the bulbs and–even better–decorative braiding! 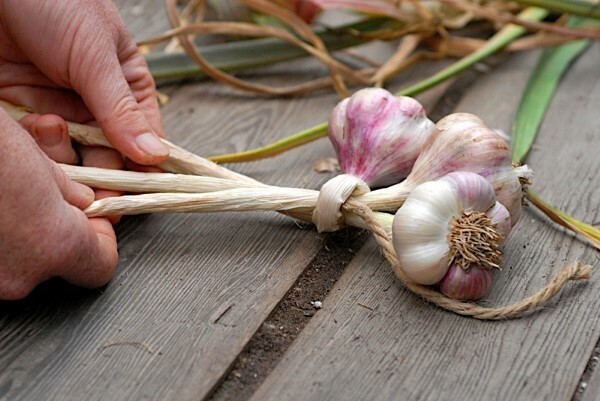 Follow these steps and learn how to braid garlic for storage and decorative uses. Garlic is wonderful for adding flavor to any number of savory dishes. You can roast it with tomatoes to make a delicious sauce, add it to pasta, soup, meat dishes, make garlic bread…the possibilities are endless! 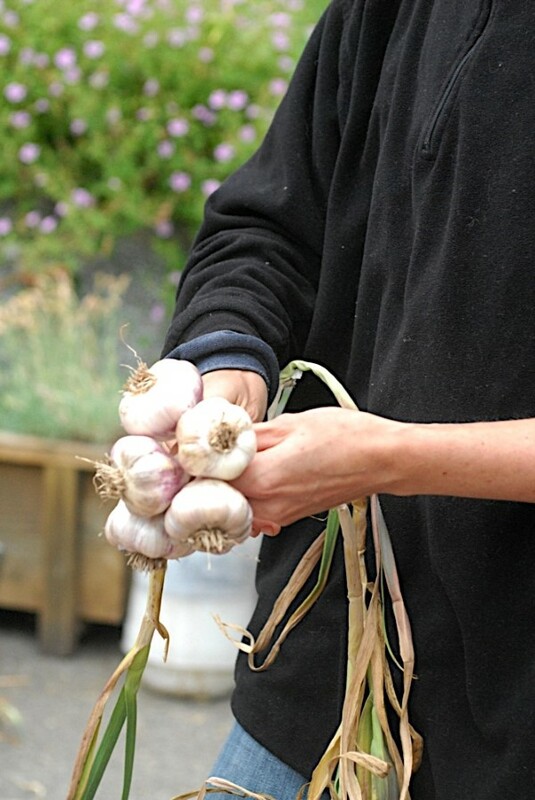 Garlic is also wonderful because it keeps well and can be enjoyed months after it is harvested from the garden. 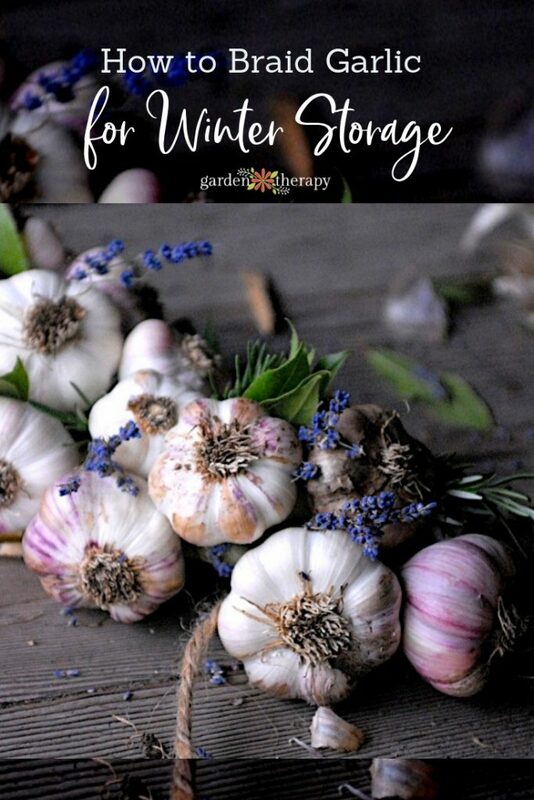 It can be tricky to figure out how to store garlic in a way that doesn’t look ugly or take up a lot of space, but braiding is a great option that keeps garlic tidy and even makes it decorative. 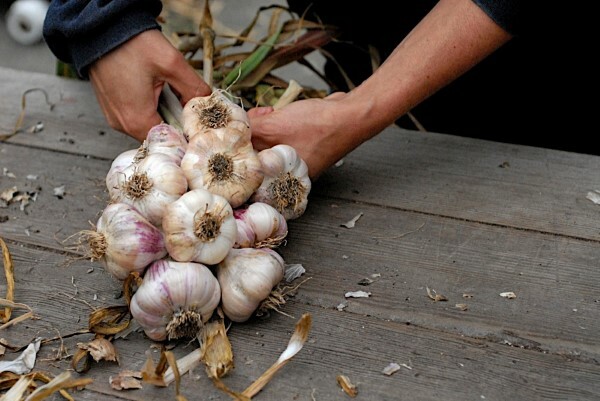 First things first, go out to your garden and harvest that garlic! Then we can learn how to form it into a beautiful braid that’s perfect for displaying or gift giving. 1. Lay three clean, dried stalks with good-sized garlic bulbs on a table with the foliage facing towards you. Place one bulb down and then place two more bulbs side by side just above it. Place the stalks of bulbs two and three underneath the stalk of bulb one, and cross them over it. Tie the stalks together using string tied with a tight knot. If stalks are pliable enough, you can tie the bulbs together without using string. 2. Place the fourth bulb between bulb two and three, aligning the stalk with the center stalk. You are now holding three groups of stalks—one on the left, one on the right, and two in the middle. Fold the left stalk toward the middle, over the middle two stalks. Now pull the middle two stalks over to form the new left side. 3. Lay bulb five beside bulb four, aligning the stalk with the center stalk again. Now fold the right-hand stalk over the two center stalks to become the new center. Pull the middle two stalks over to form the new left. 4. Repeat this sequence, alternating the side that you lay the bulbs on each time, and always aligning the stalk with the center stalk. Note that the number of stalks you fold in the middle increases each time. 5. 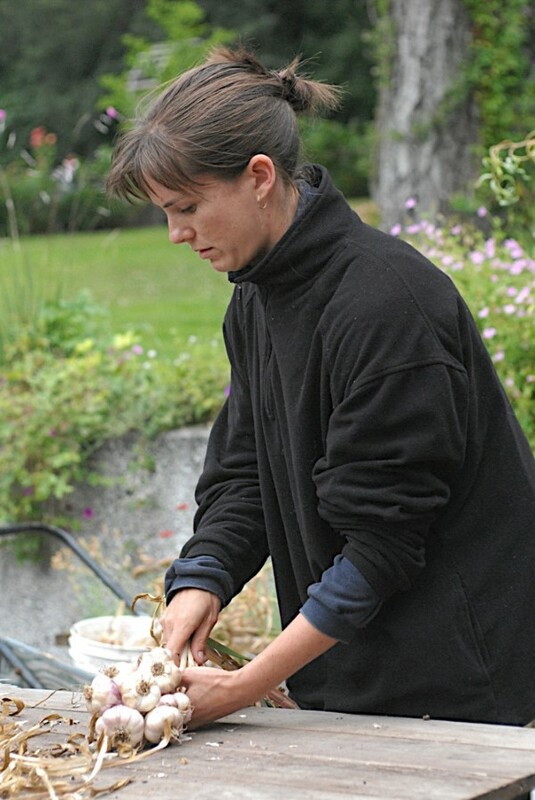 When you have braided the last garlic bulb in, carry on braiding the foliage until you are almost out of it. Tie the braid off above the last fold, leaving string to hang the braid with. 6. 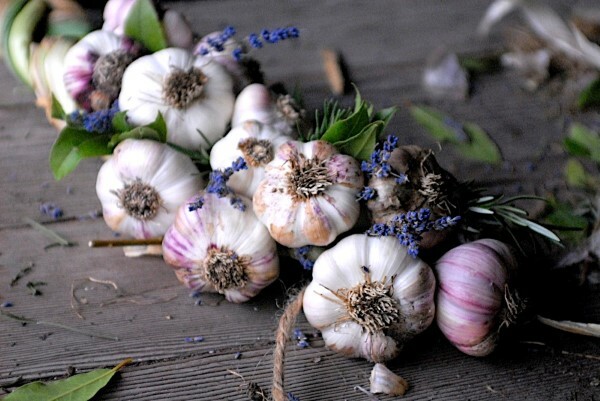 Make beautiful and decorative gifts by simply tucking bay, rosemary and lavender sprigs in with the garlic as you braid. Reprinted with permission from The Zero-Mile Diet by Carolyn Herriot © 2010. Published by Harbour Publishing. Photography © Kristin Ross. If you want to put organic home-grown fruits and vegetables on your table throughout the year using time-saving, economical and sustainable methods of gardening, grab a copy of The Zero-Mile Diet. This book is about REAL food and how eating it will change our lives for the better and is a fabulous resource for the home gardener.